Not all skincare products work for everyone. So, if the other skin care products or routines we wrote about in our previous articles didn’t work for you, we hope this one will! Isomers skin care has been around since the 1980’s. Isomers skin care was founded to solve skin problems like acne or skin aging. In this guide, we will talk about the company and its products. We have also included good and not so good reviews about Isomers Skin Care. Like we said, not all skin care products work for everyone. Read on to learn if you have found the right one for your skin. The company has 116 products available to date. To make it easier for you, we have listed here Isomers Skin Care’s most popular products. 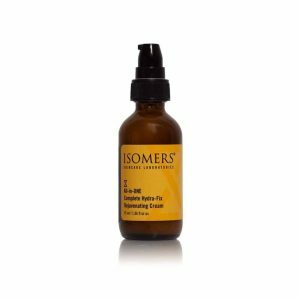 Daily Exfoliating Serum by Isomers Skin Care helps restore, renew, and re-energize your skin. This Isomers Skin Care Daily Exfoliating Serum is designed to help refine the texture of the skin. Using this product daily reveals a fresher and softer looking skin. Isomers Skin Care Daily Exfoliating Serum is a potent, acidic liquid that refreshes the skin. This serum relies on beta hydroxy and alpha hydroxy. This helps uncover a younger looking skin. You will see results quickly. The Isomers Skin Care Daily Exfoliating Serum combines AHA and BHA which are responsible for keeping the skin looking its best. You need Isomers Skin Care Daily Exfoliating Serum if you want to uncover younger-looking skin. This serum is also for you if you want to see results on your dry and flaky skin quickly. 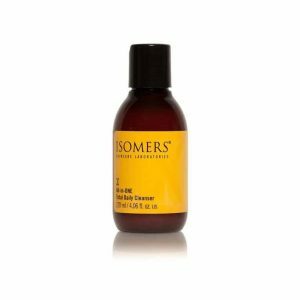 Isomers Skin Care Daily Exfoliating Serum is effective as well if your skin is sagging with lines and wrinkles appearing. How to use Isomers Skin Care Daily Exfoliating Serum? This product is applied to all skin types every night or every other night. After the application of the Daily Exfoliating Serum, you may feel a tingling sensation or a slight burning feeling. If this sensation is severe, wash your face immediately with lukewarm water. Do not use if you are routinely using retinoic acid unless the retinoic acid is discontinued for approximately 2 weeks prior to beginning the treatment. If irritation occurs, discontinue the use of the product immediately and consult your physician. Slight redness of the skin may occur as a normal effect of the treatment. The exfoliation created by this product is not usually visible to the naked eye. However, after the applications, a notable change is noted in the texture and glow of your skin. During this program do not perform any other type of peeling on your skin. Avoid contact with the eyes and mucous membranes. If contact occurs, wash immediately with water. This formula by Isomers Skin Care works to moisturize and protect the skin from dehydration. It also restores and rejuvenates to the skin. The All-in-One Complete Hydra-Fix Rejuvenating Cream is multi-dimensional and complex-skin supporting formulation. This is designed to enhance the skin and dramatically diminishes the visible signs of aging of the total face, neck and beyond. Now you can simplify your beauty routine without missing out on key skin enhancing technologies in this must-have formulation for the total face. Advanced Fortifying Serum. It targets thinning skin and sagging. Renovage Youth Complex Cream & Youth Extending Serum. It targets skin resilience to help you look younger, and healthier in the long run. Sunshine Serum. It acts as vitamins that nourish and protect against photo-aging. Metabiotics Resveratrol. It is an anti-oxidant complex that targets skin calming, firming and the dermal-epidermal junction. Tego Pep 4-17. It targets wrinkles, rough, and uneven skin. Hydra-Fix Rejuvenating Cream by Isomers Skin Care helps reduce main wrinkle depth and volume and roughness. There is an increase in skin tone and improved skin brightness and luminosity. Your skin will look more invigorated. It also helps support the skin and keeps it smoother and younger looking without dryness. Who needs Isomers Skin Care Hydra-Fix Rejuvenating Cream? It can be used by anyone regardless of skin types. Any person who purchases this product can add it as a part of a moisturizing and protecting step in a skincare routine. All-in-ONE Total Daily Cleanser by Isomers Skin Care effectively removes dirt, surface oils, and makeup without drying or irritating your skin. It does all these while supporting a healthy pH level. It is the mild all-in-one cleanser for normal to dry skin. Isomers Skin Care users love this because it is fragrance-free and non-comedogenic. This is a perfect choice for your daily skin cleansing. The Isomers Skin Care Total Daily Cleanser is perfect for people with sensitive skin. This product is also great for those who want to save time and want to avoid the many steps of a skincare routine. This product is an all in one step cleanser. It saves time and you get maximum results. It stimulates micro-circulation with gentle revealing beads which are a new PHA technology. This solution cleans deeply without the need to scrubbing or over processing the skin. This is one of Isomers Skin Care’s best products. This is an acne treatment lotion, but unfortunately, if your living outside the United States, this product is not available to you. The Clear Skin Acne Treatment Lotion is a leave on formula for the treatment of acne. It is effective in helping keep your skin clear as it balances key ingredients that are beautifying and nurturing to you. What’s great about this product is that it penetrates into your pores. This helps clear up acne blemishes, pimples, blackheads or whiteheads and allows your skin to heal. This acne treatment lotion helps keep your skin clear of new acne blemishes and prevents new blemishes from forming. 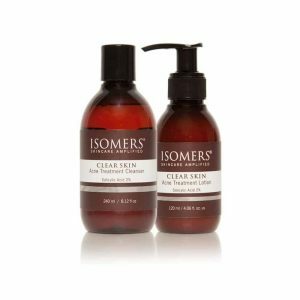 This Isomers Skin Care acne treatment lotion is formulated with 2% salicylic acid. It utilizes the power of salicylic acid to help restore and improve the overall look and quality of your skin. Most often, acne treatments can be harsh, drying, and tend to clear up the acne only to dry out and damage the skin. Clear Skin Acne Treatment Lotion works to deal with the acne but it protects and helps restore your skin. This lotion is best for renewing, healing and retexturing the skin. It refines the pores and combat bacteria. Your skin will be clear and appear to be more porcelain-like. According to their website, this product is for all ages and skin types. And can be used by those who want to treat their acne. This lip balm helps condition and protect the lips from the drying elements. It keeps your lips softer, smoother and more comfortable regardless of the weather. It is rich in Shea Butter, Vitamin E, and Lavender. Its formulation is intense and effective all year round. The Shea Butter works great for conditioning, protecting, and reducing dryness. The Vitamin E is film forming. It is an antioxidant and calming to the lips. Lavender also has a calming effect due to its soothing fragrant. Isomers Skin Care Lip Hydrating and Protecting Balm is suitable for everyone. Isomers Skin Care is one of the many skin companies that specializes in treating problems like skin aging and acne. The company was founded in Canada in 1988. Inspired by one’s own struggles with acne, Isomers Skin Care was launched by Manuela Marcheggianni. Since Manuela was 12, she suffered from impossible skin conditions. Those problems were often associated with painful humiliation. But through her experience, she learned how to act, to feel, and to react. Through her struggles, she learned a new perspective on life. Manuela was able to turn things around by using the information and tools around her. She used science and nature as her reference. She began reading a pile of skin research studies. 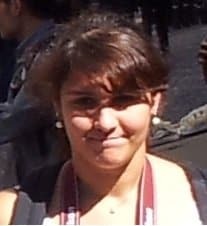 Manuela learned about the best skin care practices while she was still attending college. Initially, Manuela started creating products for herself after having struggled with acne for many years. As her skin began to show improvements, the friends of Manuela became interested in the formulations that she was using. Her friends began to notice the changes in Manuela’s skin and her boost of self-confidence. They soon started asking what products she was using and asked if she could make something for them too. And that’s how Isomers Skincare was born. 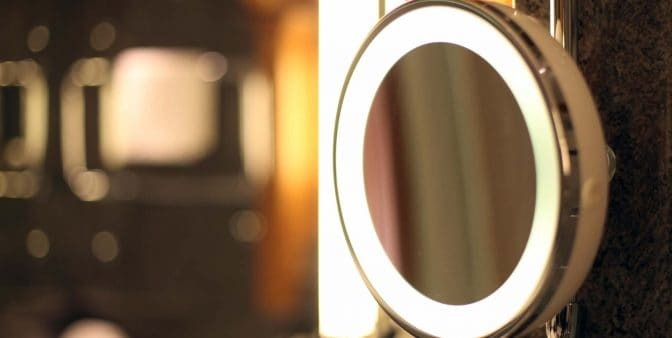 Isomers skin care’s very first laboratory was in a bachelor’s apartment. Their very first skincare product was concocted in Manuela’s mother’s blender. Manuela and her co-founders believed that specific isomers or molecules combined with certain herbs would have a synergistic effect. And it turned out, they were right. In 1988, Manuela and her co-founders unofficially launched from their studio apartment. They claim Isomers Skin Care launched unofficially because there’s no business plans or any funds for marketing and advertising yet. However, they knew they had to continue to invent products to help people with skin problems. The Isomers Skin Care did this because they knew how devastating it could be to be struggling with such problems. With no marketing budget nor a big corporation to back them up, Isomers Skin Care founders continued to work full-time and studied. They took the money they earned to buy the ingredients and bottles to make Isomers Skin Care products. They were THAT dedicated. The founders of Isomers Skin Care had to prove the efficacy of their products and not the hype of a supermodel or marketing campaign. They took the approach that the formula must speak for the company and be their advertisement and resume. They knew they were not going to have the opportunity to market their products. That is why they had to design each product in a way that whoever used them would be happy and satisfied. They wanted Isomers Skin Care users to see and experience how good their skin could become if given the right tools and information. Isomers Skin Care believed they were the tool makers and the source of information. With each passing invention and each new Isomers Skin Care fan, they saw that they were doing what they set out to do. Isomers Skin Care was able to change people’s skin, one formula at a time. People were thrilled with the results. As loyal fans, they started spreading the word to their respective family and friends. And so Isomers Skin Care grew and grew. Today, the company is revered as a Canadian icon. How Does Isomers Skin Care Work? Apparently, Isomers Skin Care does not have a central or somewhat cornerstone approach to skin care. Other companies build their entire skin care line with an organic-only products approach or they focus on one main ingredient. Isomers Skin Care is not like those kinds of companies. It seems that Isomers Skin Care suggests that the potency of its products results from blending certain chemical formulas with herbal ingredients. Meaning, they look for synergies where the combined effects of herbal ingredients and other chemicals can provide a greater effect. The products of Isomers Skin Care help minimize and reverse the effects of aging. These products are therefore not a temporary solution, but suitable for long-term results. There are a lot of Isomers Skin Care products. In fact, in total there are 116 products. Isomers Skin Care are ingredient mavens. The company is interested in and challenged by people’s evolving skin care need. All their cutting-edge ingredients are chosen, tested and retested. Then, based on their outstanding performance results, they use clinically tested amounts in their products. The ingredients are freshly made in small batches and are of the highest caliber. Isomers Skin Care don’t invent names for their ingredients or special blends of ingredients. Before you go, we have a few more notes for you. It cannot be denied that Isomers Skin Care has many interesting attributes and manufactures a wide range of products. 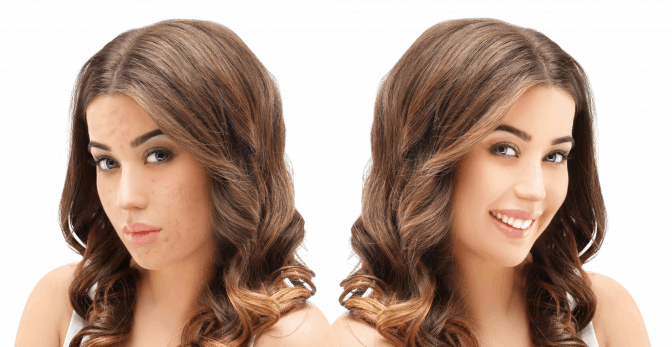 It is important that consumers with serious problems like cystic acne are advised to seek the help of a dermatologist. Also, you need to read more Isomers Skin Care reviews (if our list is not enough) to ensure that the formulations can indeed resolve such serious issues. And lastly, if you have purchased a product already, do a patch test first. That’s it, beautiful. We hope you got something from this article. Until next time! Toodle-loo!